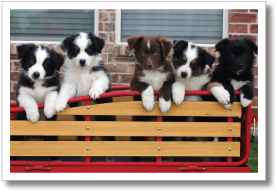 ASHGI welcomes any inquiries about Australian Shepherd genetics and health-related issues; However, please note that we are not vets and cannot give specific treatment advice. If an animal has become ill, please consult your veterinarian for proper diagnosis and treatment options. Please keep in mind that ASHGI is an all-volunteer organization. We will respond to inquiries as soon as we are able but we are not necessarily immediately available.